While countertop blenders are great for making decent sized batches of juice and soup and crushing a lot of ice, they’re overkill when it comes to making a single serving and can’t be used for making things like mayonnaise or a vinaigrette where liquids have to emulsify. That’s where a hand held immersion blender or emulsion blender can shine. There’s no need to pull out the heavy countertop blender if all you want is to quickly puree a soup for two in the same pot, mix up some pancake batter or whip up a small amount of salad dressing for a weekday dinner. Years ago, chefs had to use manual whips and some muscle for that so this relatively new kitchen tool is a real blessing. Our best stick blender reviews include a few basic and inexpensive types as well as more versatile ones for a few dollars more. You can find a range of top rated immersion hand blenders online but you should know how to choose the right one for you. The best rated immersion blenders are easy to hold and to use, can do the job quickly and are easy to clean. When shopping for one make sure that it will blend thick and fibrous veggies if you like making soups. If you like smoothies, will it create a nice and smooth texture? If you need to use it in deep pots, the wand must be long so as to reach the bottom for a thorough blend. A hand held blender should not be too heavy as that can cause arm strain but it should not be too light and fragile either. The best stick blenders are made of more stainless steel than plastic, as plastic can melt in hot liquids. If you’re looking for convenience, see if the blending wand is removable and can be put in the dishwasher. However, non-detachable wands usually means that it will last longer, so make sure that trade-off is not an issue for you. Finally, many immersion blenders come with a whisk and/or food processor attachment. If you already have separate appliances for those jobs there’s no need for these attachments but if you like having one appliance for several jobs and only need to blend for 1 or 2 people, they might be useful additions. Now that you know what to look for, we’ll make it easier for you to choose a top rated hand blender. Take a look at the ones below. Ease of use and value for money is the name of the game with the Cuisinart CSB-75. Since number of speed options is not important, switching effortlessly from low to high speed and back makes this basic option the top choice for those who want to do some occasional blending job fast and with minimum fuss. It features a comfort grip with a one-touch control to switch between two speeds, allowing you to keep control over the job. The 200W motor is powerful and the blender blade is made of stainless steel which is partially covered by a guard to minimize splatter. It is a versatile blade design so you can use it for wet or dry ingredients. Although this device is not completely stainless steel, the updated version’s plastic parts are extremely durable and users have said that it even crushes ice without a problem. The blender shaft is 5.75 inches long and detaches from the motor body so you can wash the shaft either by hand or in the dishwasher. This product also comes with a 2-cup measurement and mixing beaker that is dishwasher and microwave proof. This Cuisinart device is available in several colors so you can get one to match your kitchen decor! KitchenAid has several immersion blender models and the KitchenAid KHB1231 is the most basic and inexpensive of them all. Its 8″ long blending arm locks securely into place, while the fixed S-shaped blending blade can whip up eggs, make smoothies, shakes, mayo, soups and even baby food. You also get a 3-cup blending jar with lid that has measurement markings on the side. You can blend small quantities directly in it, close it and store in the fridge, or take it with you wherever you go. You can choose to do big batches of foods in deep pots as well, as the long blending arm allows for that. Operation is simple with just two speeds to choose from. Start on the lower speed and switch to the higher one if needed. There is no safety off on this model so you have to be careful when you’re not using it, but this can also be nice since you don’t have to switch it back on if it goes off when you haven’t used it for a couple minutes. With about 200 watts of power, you can mash potatoes and crush chipped ice, but don’t expect to crush ice cubes or chop nuts, as the blade is not designed for that. When done, just remove the blending arm and wash that and the blending jar in the dishwasher. As with the Cuisinart, this KitchenAid model comes in lots of several colors to match the rest of your appliances in the kitchen! If you like a basic hand blender but could also do with a whisk attachment, the BELLA Hand Immersion Blender is a good choice. Its wattage is slightly higher than the previous two models at 250W. The Bella comes with two soft touch speed buttons. You just press the one button for one speed and the other for a higher speed. Release the button to stop. The best way to effortlessly switch between speeds is to position your index finger over the top lower speed button and the middle finger over the lower high speed button. There is an auto shut off feature for safety. The blending arm is 6″ long, so it can be used in most pots. It can be switched out to the whisk attachment if you want to make cake batter, meringue, etc. All attachments can be cleaned in the dishwasher. The biggest plus point of this blender is its cost. Nothing else comes close to it, so while the other models may be made of more durable materials and can be used continuously for many minutes, for light and short jobs, the Bella will do fine. The Multiquick collection from Braun features several models of emulsion blenders and the Braun Multiquick 5 Blender MQ505 is the best of the basic models. It also has the collection’s unique PowerBell technology for the blending shaft where the bell shape coupled with the blades creates powerful and precise blending performance while reducing suction that makes the end stick to the bottom of the vessel. In addition to the normal running speed button, you also have a TurboSpeed option to power up after the initial blending. The 350W German-engineered motor balances power with long-lasting durability. You can makes sauces, soups and dips, whip cream and even cold-process soap. This model is not recommended for crushing ice or mashing potatoes. The shaft is easily detachable with a simple single click of a button. You also get a 20 ounce beaker and a whisk attachment with this model. 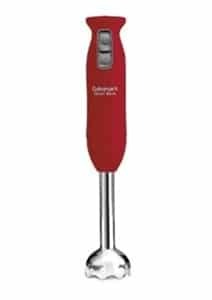 The All-Clad Stainless Steel Immersion Blender may be basic but it is much more powerful than all the others in this bracket with a 600 watt motor. Its extra long 9.25 inch blending shaft with a large blending head makes it the best for extra large and deep pots. If you cook for a large family or want an immersion blender that comes close to doing the work that a countertop blender does, then this should be your pick. It’s as close to restaurant quality as you can get. You get variable speed control along with the power and turbo speed switches and you also get a pulse setting. The large head keeps splatter to a minimum. Since the shaft is detachable for easy cleaning and storage, you can buy the mini chopper and whisk attachments separately for a more all-round blending experience. With just the blender shaft, you can make smoothies, soups, make baby food, cake batter, whip up cream and make mayo and even chop nuts. Now we come to a more expensive option. This Breville BSB510XL model may be pricier but this is because it is the best hand held blender option for home cooks and is built for daily use. At 280W, its power enables you to crush through large batches of ice and even the most fibrous of veggies can be broken down to a smooth consistency. The blender wand is 8” tall so you can use it in deep pots and jars. The design of the detachable stainless steel wand is also unique – the bell shape and internal ribbing reduces suction power it moves about the bottom of the jar efficiently and without scratching, which is also prevented by the included scratch guard. The handle is ergonomically designed and the soft touch trigger makes it the easiest to use even for tough batches of food. There are 15 variable speeds so this workhorse is also completely multi-functional, whether it’s for blending, pureeing, whipping or emulsifying. It also comes with a whisk attachment, a blending jug and a chopping bowl. The Breville hand blender and chopper is one of the few hand held blenders that comes with a long power cord at 6 feet. Click here for more emulsion blenders that come with multiple attachments for a variety of jobs. For the few cooks that prefer a cordless device, this Braun MQ940CC Multiquick 9 Cordless has the best customer reviews. Now this appliance is a 220V one so it cannot be used as it in the USA, but you can buy an inexpensive EU to USA plug adaptor and it’ll work fine. It is probably the most powerful of the cordless ones at 110 watts and you can blend a smoothie at full power for 5 minutes straight on a full charge or for 20 minutes for others and it’ll hold its charge for up to 3 months in storage. The unique blending bell shape coupled with the hard stainless steel blades ensures powerful performance. It comes with a charging unit that doubles up as a holder, so you can just store the blender on the counter when not in use. Want a partial charge quickly? Just charge it for 15 minutes, or if you want it fully juiced then charge for 2 hours. This is also a multipurpose stick blender as it comes with a 1.25 litre chopper attachment that can chop nuts, meat, veggies and fruit, crush ice and work like a mini personal blender with the jug blender. This Kitchenaid Pro Line Series model is one of the most popular cordless options even though it costs a pretty penny. In general, appliances that run on batteries are not as powerful but what you lose in that department you gain in ease of use since the cord won’t get in your way and you can do your blending just about anywhere at home. This appliance from Kitchenaid is a worthy contender among best hand blenders because it is just as powerful as most others. The lithium-ion battery is rechargeable and performs well for a reasonable amount of time before needing to be plugged in again. There are two different length blending arms of 8” and 13” and 5 attachments that include 3 interchangeable bell blade assemblies for various uses like blending, chopping, whisking, shredding, frothing and pureeing. Hopefully, our recommendations have helped you answer the question “What is the best immersion blender to buy?” But if you want something that also crushes ice for frozen drinks or purees ingredients for soups, take a look at our picks for inexpensive countertop blenders.